Hail struck a number of areas over the past week, and canola damage ranged from light to total destruction. 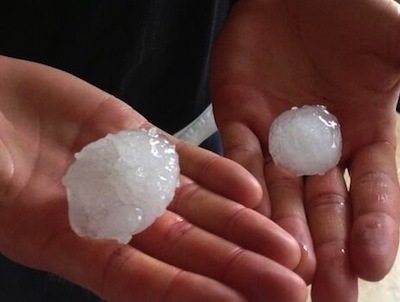 The photo above shows a couple hailstones collected around Lethbridge this week. Canola has a remarkable capacity to recover from light hail at early flowering — although if the flowering period is extended as a result, the crop may benefit from a second fungicide application. 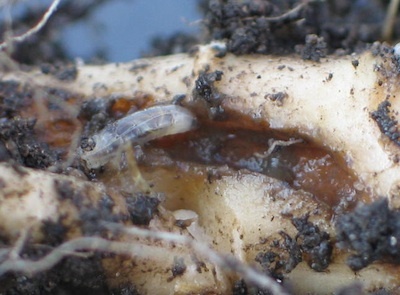 Sclerotinia stem rot management continues this week. The ideal fungicide timing is 20-30% flowering. 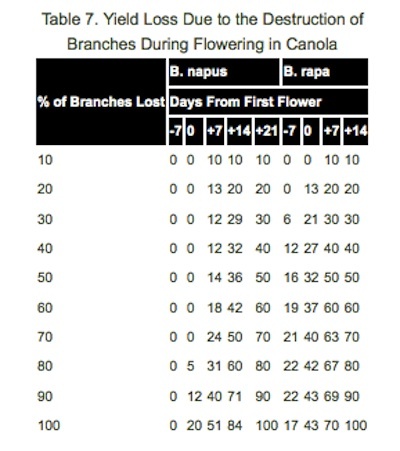 Crops most likely to provide a return on investment have had moisture (even average moisture is ample) before and during flowering, a humid canopy, and 30+ bu./ac. yield potential. The window closes for fungicide application at 50% flowering. The most damaging time for insect feeding is late flowering and through pod fill when canola plants have little capacity to recover. Lygus, diamondback moth and bertha armyworm are the big ones to watch during this period. Adult scouting continues for bertha armyworm. Diamondback larvae are starting to appear in fields at low levels. Lygus numbers are building in some areas, and in rare cases, an application during flowering may be needed to move the crop along. Lygus and adult cabbage seedpod weevil feeding during the bud stages is one possible reason for missing pods. 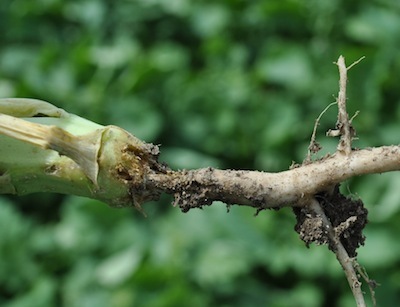 Growers seeing missing pods on canola stems may be inclined to blame last week’s heat, but insects or something else may have been at work before the heatwave. Click here for more reasons for missing pods. Follow @CanolaWatch and the CCC agronomy team on Twitter. 10. Crops are in the 20-50% flowering window, yield potential is OK, there’s moisture in the canopy and you have sclerotinia spraying to do. 9. Cabbage seedpod weevils have moved into your area for the first time, and you have to do sweep netting to see if thresholds are at 2 per sweep. 8. Hail rolled through and you have to check fields for damage levels. 7.This is a great time of year to attend a local canola tour or extension event. 6. We’ve got nothing for this spot. 2. Check #ABbugchat on Twitter just to make sure you haven’t missed anything. 1. Oh heck, set aside a day and go fishing. You deserve a break. 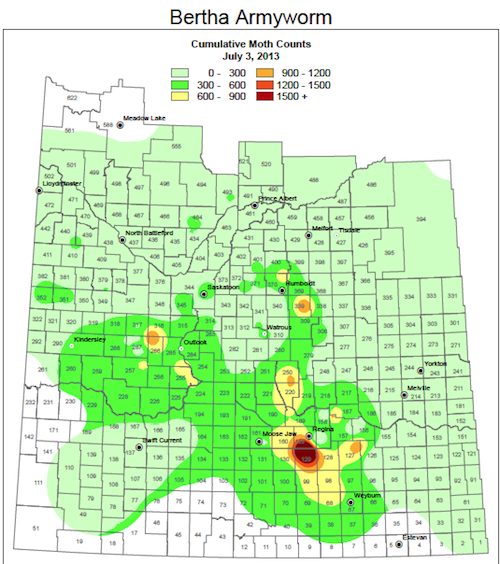 Bertha armyworm adult trap counts suggest low to medium risk in most areas this year, with a couple higher risk hot spots in Saskatchewan — south of Regina being the largest. (See the map above.) Any need to spray is at least two weeks away. Larvae do the damage, and spraying should only occur if larvae feeding reaches threshold levels. Note that even in areas deemed low risk by adult counts, isolated areas of heavy larvae feeding can occur. Don’t completely let your guard down even if adult numbers are low.